Archaeological park with remains of the ancient core of Jerusalem, dated to the Canaanite and first temple periods. 2 Samuel 5 6: "David took the strong hold of Zion: the same is the city of David". The 3,000 years old city, established by King David, is located on a low ridge above the Gihon spring, southeast of the temple mount. The location of this ancient core of Jerusalem, and the earlier Canaanite city of the Jebusites, was forgotten after three millenniums of the successive constructions and destructions. 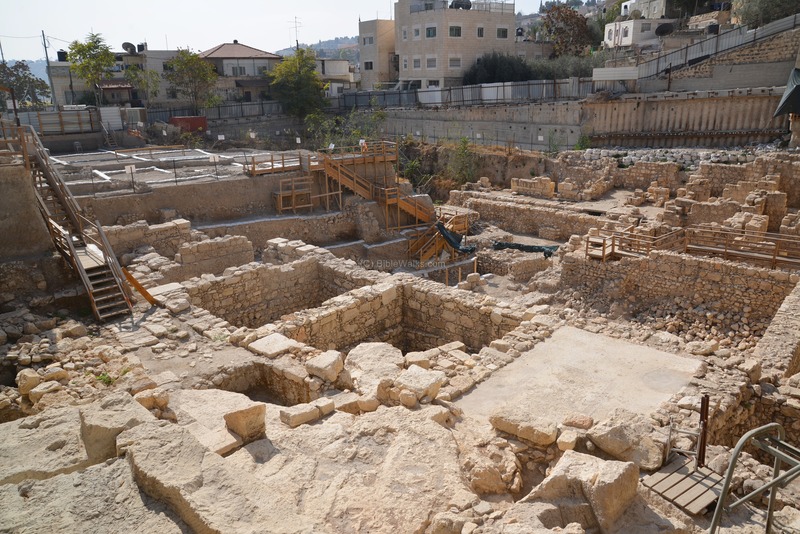 Recent excavations have revealed sections of the palace, fortifications, water supply and other interesting remains from the Canaanite and Israelite cities. This archaeological park is one of Israel’s most important historical landmarks, a must-see site for all Bible-Walkers. The location of the "City of David" , and other points of interest, are shown in this aerial view. The archaeological park is adjacent to the Dung gate, south of the old city walls. The ridge of the City of David was first settled during the end of the Chalcolithic period, some 5,000 years ago. The caves above the Gihon spring, on the eastern hillside, were in use as living quarters during that time or later during the Early Bronze age. In the 18th Century B.C., a fortified city - named Salem or Shalem - was constructed on the ridge above the spring. A reference to Salem, probably a wealthy and influential city, was noted in the meeting of Abraham with the King of Salem (Genesis 14, 18-20): "And Melchizedek king of Salem brought forth bread and wine: and he was the priest of the most high God. And he blessed him, and said, Blessed be Abram of the most high God, possessor of heaven and earth. And blessed be the most high God, which hath delivered thine enemies into thy hand. And he gave him tithes of all". Melchizedek is not only a king, he is a priest of a high God - Shalem. This was a Canaanite God of sunset, also called Salim or Salem. The center of worship was Jerusalem, probably on the high place above the city - the hill of Moriah, the Temple mount. The holiness of the site of Canaanite worship was transformed later to the Holiest site for the Israelites, a pattern known from other Holy places such as Shiloh. The city is also referenced in several Egyptian sources, starting in the 19th Century (12th Dynasty) enemy-curse clay tablets (execration texts) as Ushamam or Ushalmam. The city is mentioned as "Urasalim" in the Tell el-Amarna letters, a 14th century BC Egyptian archive of clay tablets. During that time, 18th Century B.C., the Canaanites built a massive tower above the Gihon spring, since it was the main source of water supply in the area. The tower was connected to the fortified city above the spring, allowing exclusive access to the water during siege, while channeling the waters to the fields of the valley of Kidron during peaceful times. The water complex was one of the advanced engineering projects in that time, as the Canaanites cut long tunnels into the rock for supporting the access to the spring, creating a large reservoir pool, and channeling the waters outside to the valley. 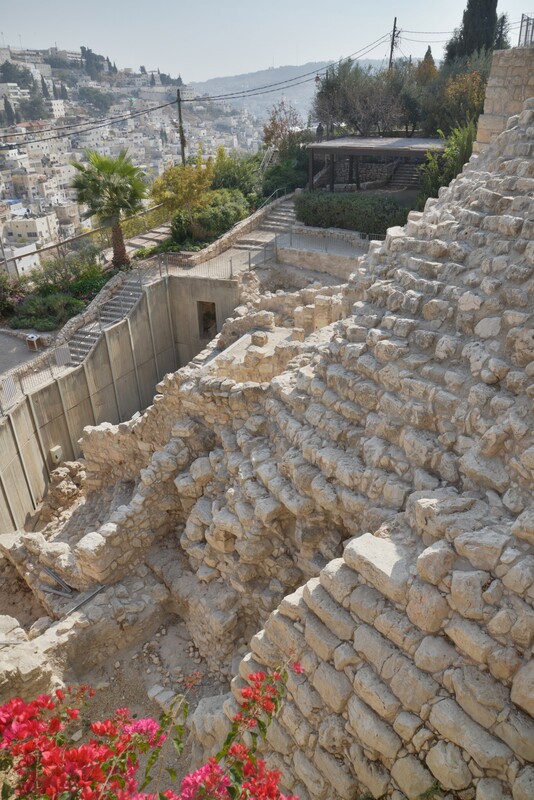 The walls of the city were massive, as recently unearthed in the excavations of the Gihon spring tower. These fortifications made the Canaanite city very well protected. "Now it came to pass, when Adonizedec king of Jerusalem had heard how Joshua had taken Ai... Therefore the five kings... gathered themselves together, and went up... Joshua therefore came unto them suddenly... And the sun stood still, and the moon stayed, until the people had avenged themselves upon their enemies". Joshua chased the 5 Amorite kings down to Azekah. 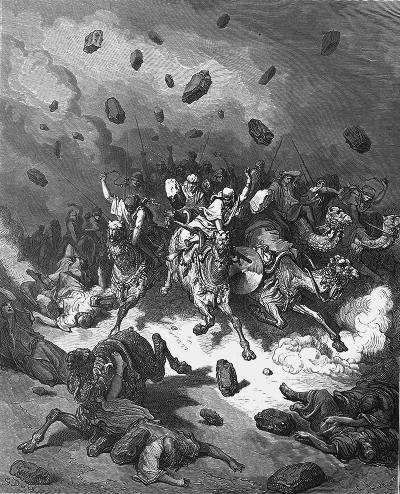 The Israelites slew the Amorites, and God casted great hailstones which destroyed them (Joshua 10 10-11). "And the children of Benjamin did not drive out the Jebusites that inhabited Jerusalem". "And the king and his men went to Jerusalem unto the Jebusites, the inhabitants of the land: which spake unto David, saying, Except thou take away the blind and the lame, thou shalt not come in hither: thinking, David cannot come in hither. Nevertheless David took the strong hold of Zion: the same is the city of David. And David said on that day, Whosoever getteth up to the gutter, and smiteth the Jebusites. , and the lame and the blind that are hated of David's soul, he shall be chief and captain. Wherefore they said, The blind and the lame shall not come into the house. 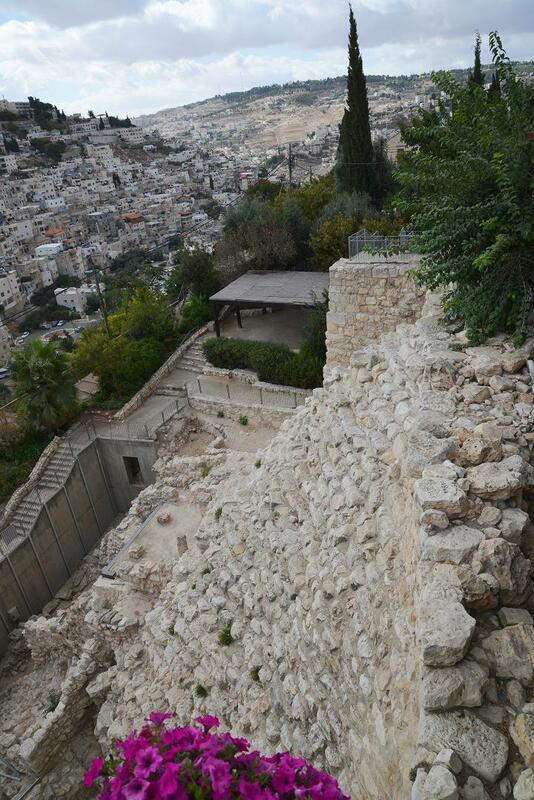 So David dwelt in the fort, and called it the city of David. And David built round about from Millo and inward.". 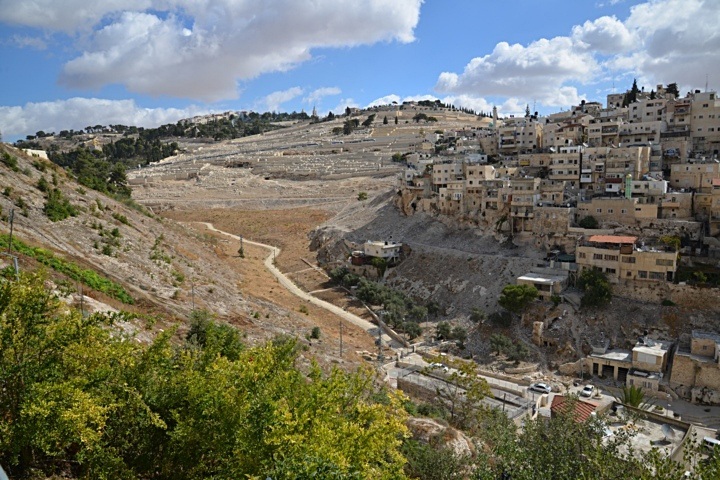 David rebuilt the Canaanite city on the ridge west of the Kidron valley, above the spring. Recent excavations in this area have revealed probable traces of the ruins of the royal palace area. The excavations unearthed may interesting findings, such as bullae (clay seals) bearing names of officials of the Judean Kingdom, which are named in the Bible. The Gihon spring is mentioned in the event of the anointment of David's son, Solomon, in parallel to the attempt of Adonijah's to replace David. The spring is located under the palace, as David commands Zadok the priest and Nathan the prophet to "bring him down" to the spring (1 Kings 1:33-34, 39): "The king also said unto them, Take with you the servants of your lord, and cause Solomon my son to ride upon mine own mule, and bring him down to Gihon. And let Zadok the priest and Nathan the prophet anoint him there king over Israel: and blow ye with the trumpet, and say, God save king Solomon... And Zadok the priest took an horn of oil out of the tabernacle, and anointed Solomon. And they blew the trumpet; and all the people said, God save king Solomon.". King Solomon enlarged the city of Jerusalem. He built the first temple on top of Mt. Moriah, which is located to the north of the city of David. 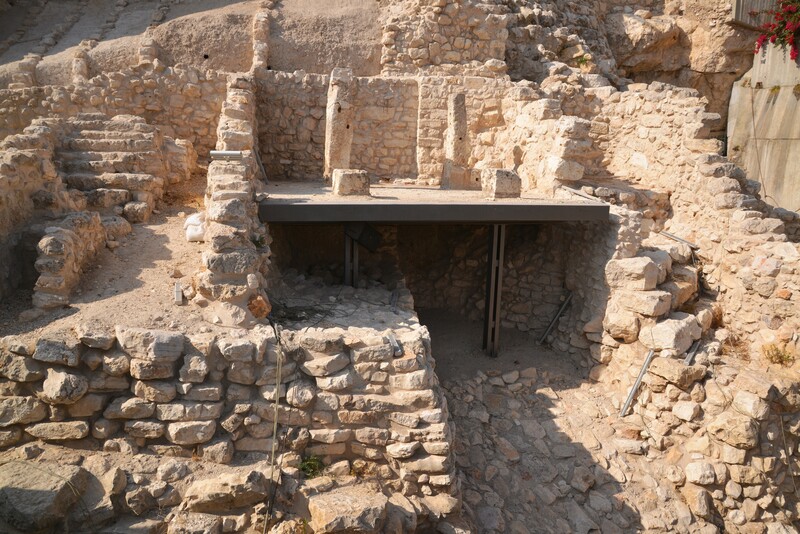 Solomon built the royal palace in the Ophel, between the temple mount and the city of David, and connected these two sections within the new walls. The city expanded to the north and west. After his times, the united Israelite kingdom split, while Jerusalem became the capital city of the southern kingdom of Judea. The Assyrian empire conquered Syria and the North of Israel during the reign of the Assyrian king Shalmaneser III. The Assyrian king, probably named in the Bible as "Shalman", invaded to Syria and the northern part of Israel in the first Assyrian intrusion (841 B.C.). This conquest continued in a second intrusion (738) by the great Assyrian king Tiglath-Pileser III. Pekah son of Remaliah, the king of the Northern Israelite kingdom, tried to block the Assyrians. He attempted to create a coalition with the Rezin king of Aram-Syria and with the Judean Kingdom. However, King Ahaz (the grandson of Uzziah) refused to join them. Pekah then tried to replace Ahaz with the son of Tabeal, and attacked Judah (Isaiah 7 6). This attack encouraged the Adomites and the Philistines to attack Judah (2 Chronicles 28 18). Ahaz was under pressure from all fronts, and called the Assyrians for help, although prophet Isaiah warned against the move (Isaiah 7 4). The Assyrians quickly came to the help of Judah: In 734BC was an intrusion to the North of Israel by the Assyrian King Tiglath-Pileser III. The Assyrians first captured the coastal cities until Gaza, subduing the Philistines. At a second intrusion (732) they captured some of the cities of the Northern Israelite Kingdom (as per 2 Kings 15: 29): "In the days of Pekah king of Israel came Tiglathpileser king of Assyria, and took ... Galilee...and carried them captive to Assyria". The Egyptians encouraged the people in the occupied territories of the Assyrians to revolt following the death of Tiglath-Pileser III. Hoshea, king of Northern Israel, joined this mutiny, but made a fatal mistake. This time the Assyrians crushed the remaining territories of the Northern Kingdom. The intrusions of kings Shalmaneser V and Sargon II in 724-712 ended the Northern Kingdom (2 Kings 17: 5-6). Refugees from the Northern Kingdom settled in Jerusalem. The South Kingdom of Judah managed to survive this onslaught by teaming up with the Assyrians, but not for long. After the death of the Assyrian king Sargon II (705 B.C. ), king Hezekiah, son of Ahaz, mutinied against the Assyrians, joining other cities in the area who attempted to free themselves from the Assyrian conquest. Anticipating the coming Assyrian intrusion, he fortified Jerusalem and the major cities. "And when Hezekiah saw that Sennacherib was come, and that he was purposed to fight against Jerusalem, He took counsel with his princes and his mighty men to stop the waters of the fountains which were without the city: and they did help him. So there was gathered much people together, who stopped all the fountains, and the brook that ran through the midst of the land, saying, Why should the kings of Assyria come, and find much water?". The tunnel brought the spring waters into the walls of the city of David, rather than flowing out to the Kidron (2 Chronicles 32 30): "This same Hezekiah also stopped the upper watercourse of Gihon, and brought it straight down to the west side of the city of David". The tunnel project is also summarized in Hezekiah's Biblical "obituary" (2 Kings 20 20): "And the rest of the acts of Hezekiah, and all his might, and how he made a pool, and a conduit, and brought water into the city, are they not written in the book of the chronicles of the kings of Judah?". 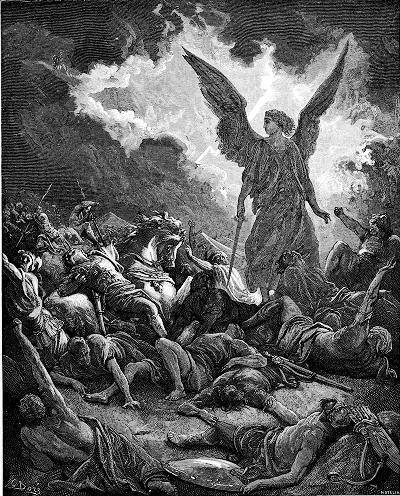 "And the LORD sent an angel, which cut off all the mighty men of valor, and the leaders and captains in the camp of the king of Assyria. So he returned with shame of face to his own land. And when he was come into the house of his god, they that came forth of his own bowels slew him there with the sword. Thus the LORD saved Hezekiah and the inhabitants of Jerusalem from the hand of Sennacherib the king of Assyria, and from the hand of all other, and guided them on every side". The Assyrian empire fell in 610 B.C., and was replaced by the Babylonians. During the empire switchover, the Judean King Josiah (628 to 609BC) seized the moment and expanded the Kingdom (2 Kings 23). This was the greatest times for the Judean Kingdom, which lasted for a short time, since Josiah was killed in a battle at Megiddo. The Babylonians, headed by Nebuchadnezzar, conquered the coastal cities in 604 BC (2 Kings 24 7), and later destroyed Judea and Jerusalem in 587. The temple and Jerusalem were destroyed, and some of the population were exiled. The Persians defeated the Babylonians (539BC), and King Cyrus "the Great" allowed the Judean exiles to return back to Israel (Zion) and rebuild their temple in Jerusalem. In 444 B.C., Nehemiah the Governor rebuilt the walls of Jerusalem, including the ruined walls of the city of David. Sections of his walls were excavated on the eastern side of the ridge. 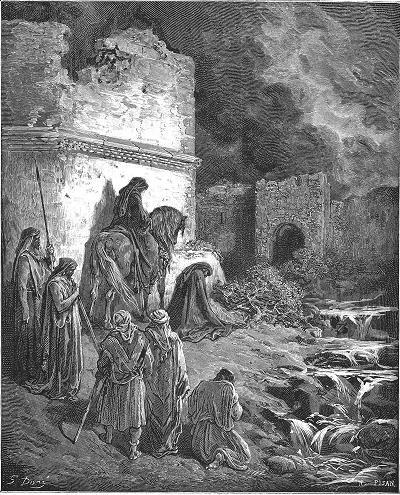 Nehemiah's night tour around the ruined city of David are illustrated on the right, and detailed in these Biblical verses (Nehemiah 2 13-15): "And I went out by night by the gate of the valley, even before the dragon well, and to the dung port, and viewed the walls of Jerusalem, which were broken down, and the gates thereof were consumed with fire. Then I went on to the gate of the fountain, and to the king's pool: but there was no place for the beast that was under me to pass. Then went I up in the night by the brook, and viewed the wall, and turned back, and entered by the gate of the valley, and so returned". According to the Roman period Historian Josephus Flavius, this area became a fortified compound during the Hellenistic period. Antiochus IV, ruler of the Seleucid Empire, constructed a fortress ("Aqra"), following his sack of the city in 168 B.C. His deeds, and the fortified compound, played significant roles in the struggle of the Jewish freedom-fighters - the Hasmoneans. Although the majority of the city and the temple were liberated by the Jewish fighters in 164 B.C., as celebrated each year in Hanukah, the compound continued to be held by their enemies until Simon Maccabeus besieged and captured the fortress (141). According to Josephus, the location of the Aqra was in the entire area of the lower city ("City of David"), although there are scholars who locate the Aqra at different areas of the city. Jerusalem witnessed major historical events during the following 24 centuries. These events are covered in other BibleWalks pages, as this page focuses on the first temple and the early second temple period. 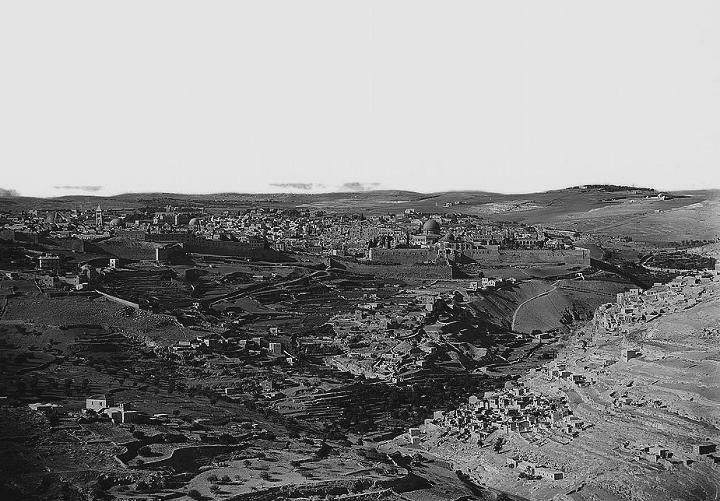 A view of the area of the City of David is seen in the 19th Century photo, before it was populated by modern houses and roads. 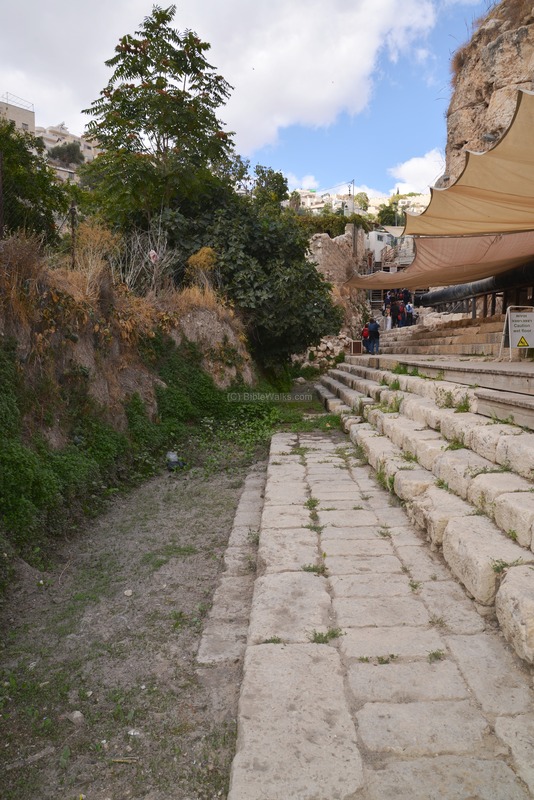 The hill on which the ruins of the first temple palace is located is along a low ridge, just south of the Ottoman walls of the city, and west (left) of the Kidron valley. 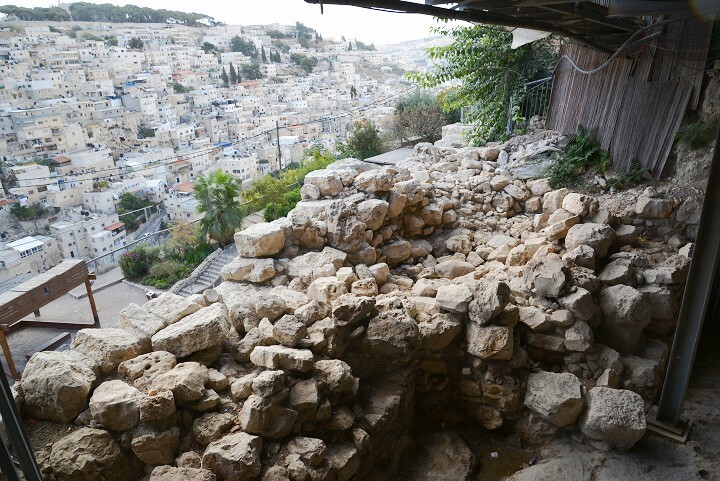 Over the years, the place of the City of David was forgotten. The location of the ancient core of the Holy city was rediscovered only toward the end of the 19th Century B.C., following the first archaeological excavations. In 1986 a non-profit organization, Ir-David foundation (El-Ad) was established with the purpose of revealing and connecting the people to the ancient Jerusalem glorious past. 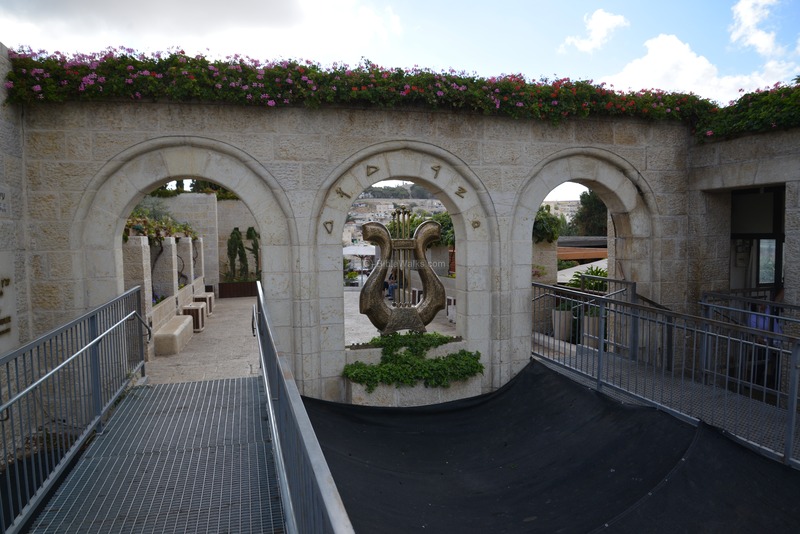 The foundation established and manages the Archaeological park of the City of David, as well as sites on Mount of Olives and Armon Hanatziv. The foundation sponsored archaeological excavations, reconstruction of the ancient sites and development of tourism in the area of the ancient core of Jerusalem. A new visitor center is planned to be constructed on the west side of the City of David, above the Givati parking place. This development will further expand the tourism infrastructure on the south side of the old city. The location of the City of David is on a ridge southeast of the old city of Jerusalem. 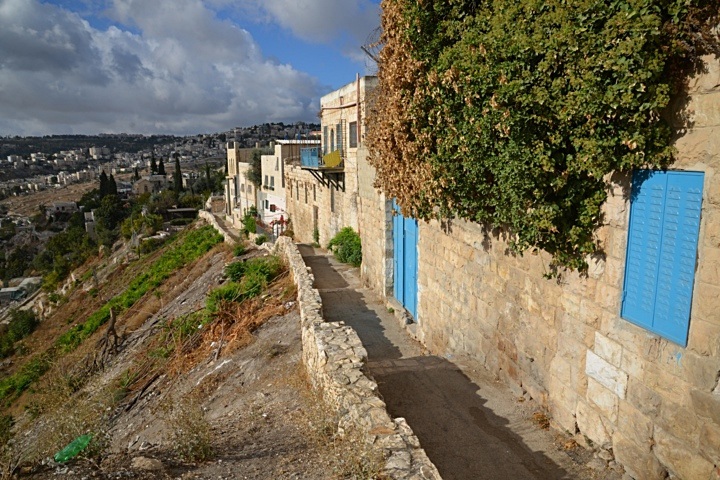 A view from the south side of the village of Silwan shows the position of the City of David, and the major points of interest. The next photo shows the line of houses above the western side of the Kidron valley, as viewed from the north. The visitor center is located behind the last house. 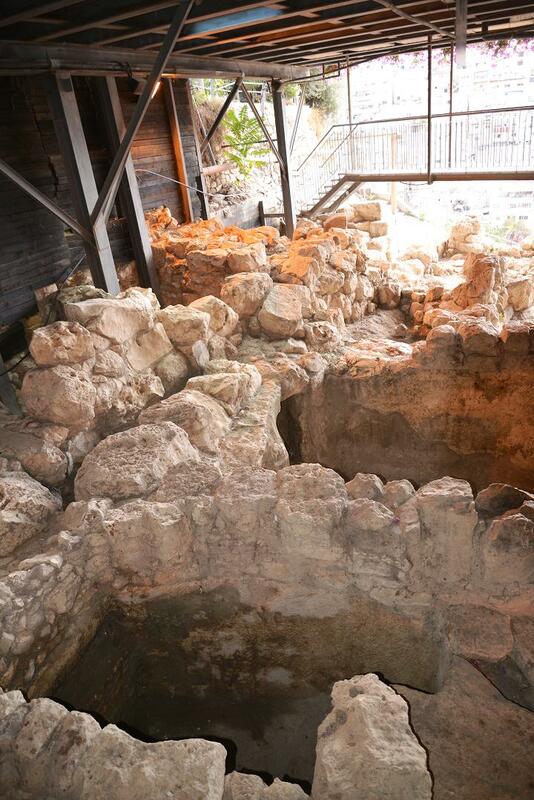 The archaeological park of the "City of David" is accessible through the street of Ma'alot Ir David (Hebrew: "City of David Ascent"). The corner of the street is just a few dozen meters east of to the Dung Gate, near the southern side of the temple. 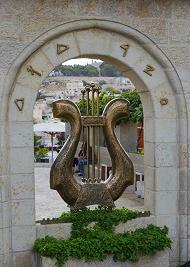 The entrance of the visitor center is decorated with the harp, the musical instrument which symbols David. 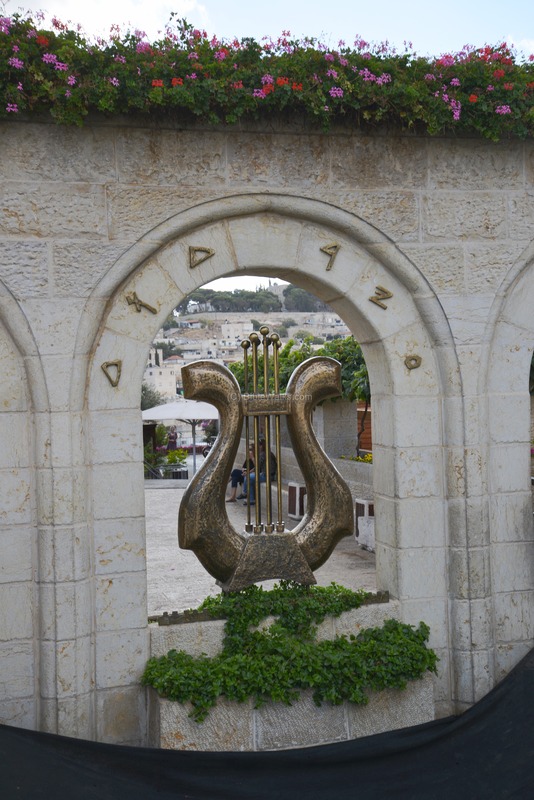 The words above the harp are "Ir David" (City of David), written in ancient Hebrew letters. Why Harp? 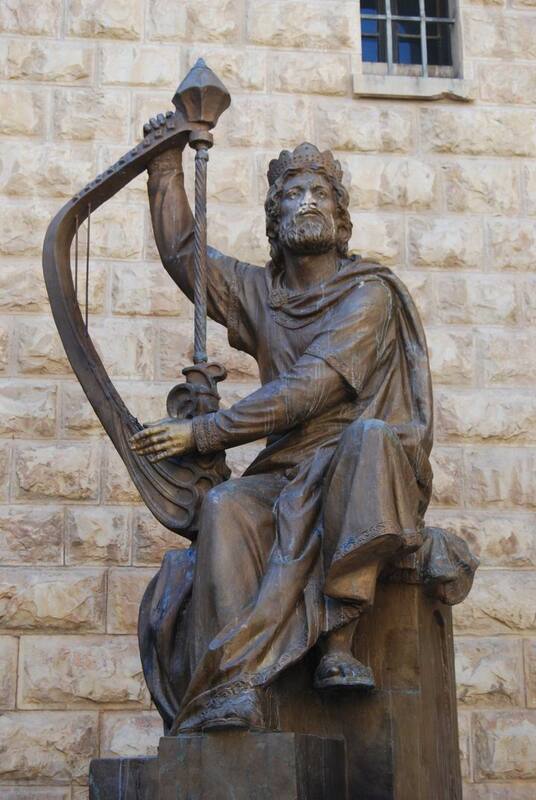 King David was a talented harp musician and is often illustrated playing the harp. The Bible tells us that he played for King Saul to calm him from his bad moods (1 Samuel 16: 23): "David took an harp, and played with his hand". 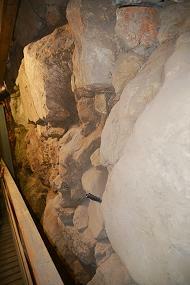 Under the platform of the visitor center is a new excavation site, which was uncovered in 2005. This layer was buried under the second temple and Byzantine period. After removing these layers, the archaeologists found these walls, which may have been constructed in the early 10th Century B.C. The field stones were a foundation of a large public structure, but its upper side did not survive. The archaeologist who headed this excavation was Eilat Mazar. According to her numerous findings, this might have been part of David's palace. As per the Bible (2 Samuel 5:11): "And Hiram king of Tyre sent messengers to David, and cedar trees, and carpenters, and masons: and they built David an house". One of the amazing Biblical discoveries were two Bullae (clay seals) dated to the beginning of the 6th C BC, bearing the name "Gedaliah ben Pashur" and "Yehuchal ben Shelemayahu" (seen on the right). Both officials are named in the Bible in conjunction was the prophet's doomsday prophecy (Jeremiah 38:1): "Then ... Gedaliah the son of Pashur, and Jucal the son of Shelemiah... heard the words that Jeremiah had spoken unto all the people...". This is the first time two bullas bearing the names of a single Bible verse have been discovered in one place. Jeremiah's prophecy angered the King, who threw him in the dungeon (Jeremiah 38 6): "Then took they Jeremiah, and cast him into the dungeon of Malchiah the son of Hammelech, that was in the court of the prison: and they let down Jeremiah with cords. And in the dungeon there was no water, but mire: so Jeremiah sunk in the mire". This dungeon was probably located in one of these cisterns seen in the photos. This area, on the eastern foothills of the City of David, was a residential quarter of the royal officials serving in the first temple administration. On the bottom of the wall is a first temple dwelling, built in the common style of that period, known as the Israelite "four-room" house. The photo shows a tall stepped stone structure, which served as a retaining wall. It may have been part of the Canaanite city wall (13th or 12th Century B.C. 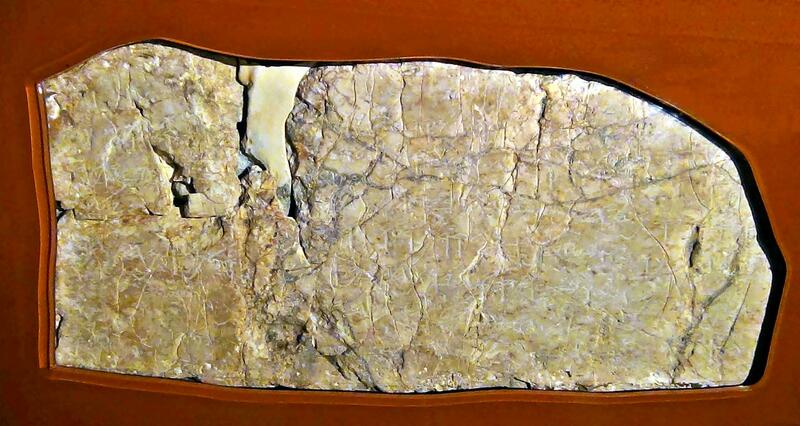 ), and was later captured by David (about 1,000 B.C.). The quarter was destroyed by the Babylonians (586 B.C. ), which ended the first temple period. The following photo shows a view of this area from the south side, with the "four-room" house at the bottom of the wall. In the ruins of this house the excavators found a potsherd with the name Ahiel, so this structure was named the "House of Ahiel". Another house stood on the north side of Ahiel's house, seen below on the lower left side of the picture. Inside this house was a room that was burnt during the Babylonian destruction (586 B.C.). In the rubble the archaeologists found arrowheads and burnt furniture. "And it came to pass in the fifth year of Jehoiakim the son of Josiah king of Judah, in the ninth month, that they proclaimed a fast before the LORD to all the people in Jerusalem, and to all the people that came from the cities of Judah unto Jerusalem. Then read Baruch in the book the words of Jeremiah in the house of the LORD, in the chamber of Gemariah the son of Shaphan the scribe, in the higher court, at the entry of the new gate of the LORD's house, in the ears of all the people. When Michaiah the son of Gemariah, the son of Shaphan, had heard out of the book all the words of the LORD, Then he went down into the king's house, into the scribe's chamber: and, lo, all the princes sat there, even Elishama the scribe, and Delaiah the son of Shemaiah, and Elnathan the son of Achbor, and Gemariah the son of Shaphan, and Zedekiah the son of Hananiah, and all the princes". Another seal with a name known to us from the Bible was of the priest Azariah son of Hilkiah (1 Chronicles 9:3,10,11): "And in Jerusalem dwelt...And of the priests.. And Azariah the son of Hilkiah...". After the return of the exiles (Ezra and Nehemiah), the ruined houses remained outside of the new city wall. 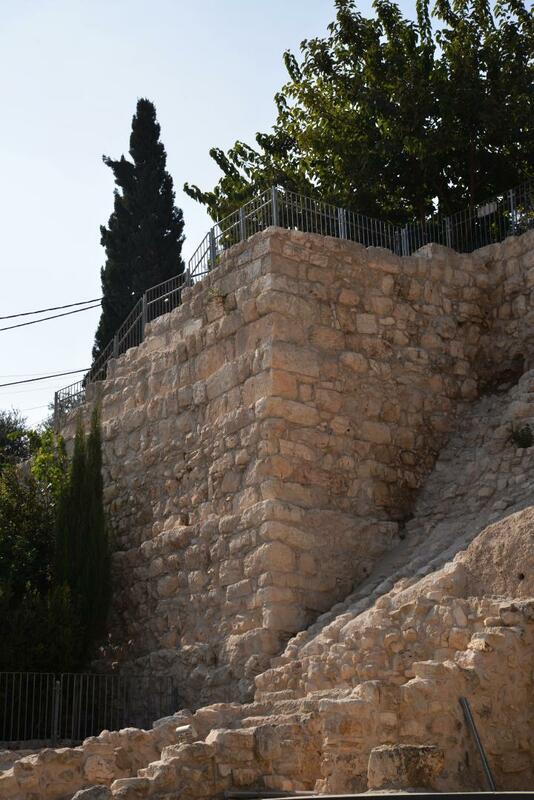 A section of the wall of Nehemiah, built in the middle of the 5th Century B.C., stands right behind the stepped stone structure wall. Remains of a tower from Nehemiah's wall was located to the north of the stepped stone structure, but was dismantled during the excavations. Another tower is seen on the south side, as viewed on the left side of the photo below. Nehemiah's tower is now used as an observation point, just like its original function 2,500 years ago. A nice view of the Kidron valley and Mount of Olives is seen from the observation point. The Gihon spring was the source of the city's water supply. 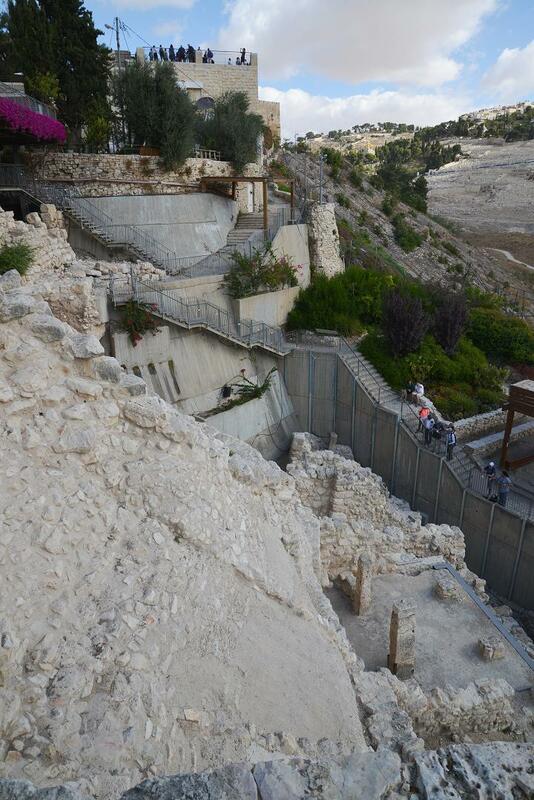 It is located 67m below the top of the ridge on which the City of David is built. A path leads the visitors down to the entrance of the Gihon water supply complex. Due to its importance during war, the spring was heavily fortified and hidden. The entrance to the spring was through a series of tunnels., which were cut into the rock during the Canaanite period (18th Century B.C.). The spring and the access way were protected by a massive tower that was connected to the walls of the city. The Canaanite cut a water channel in the lower level of the rock. It connected the spring to a pool located in the Kidron valley, where it was used for drinking water and irrigation of the Kidron valley. This tunnel may have been the "gutter" in which David's soldiers entered into the city of the Jebusites (2 Samuel 5 6-9): "And the king and his men went to Jerusalem unto the Jebusites, the inhabitants of the land: which spake unto David, saying, Except thou take away the blind and the lame, thou shalt not come in hither: thinking, David cannot come in hither. Nevertheless David took the strong hold of Zion: the same is the city of David. And David said on that day, Whosoever getteth up to the gutter, and smiteth the Jebusites. , and the lame and the blind that are hated of David's soul, he shall be chief and captain. Wherefore they said, The blind and the lame shall not come into the house. 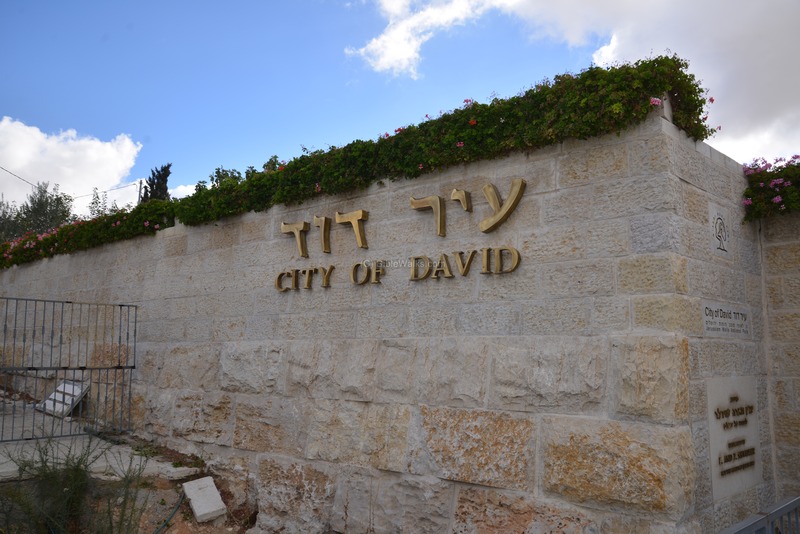 So David dwelt in the fort, and called it the city of David. And David built round about from Millo and inward.". To read more about the water supply complex, check our web page of the Gihon spring. The waters of the Gihon spring were diverted during the 8th Century B.C. to the south side of the City of David. 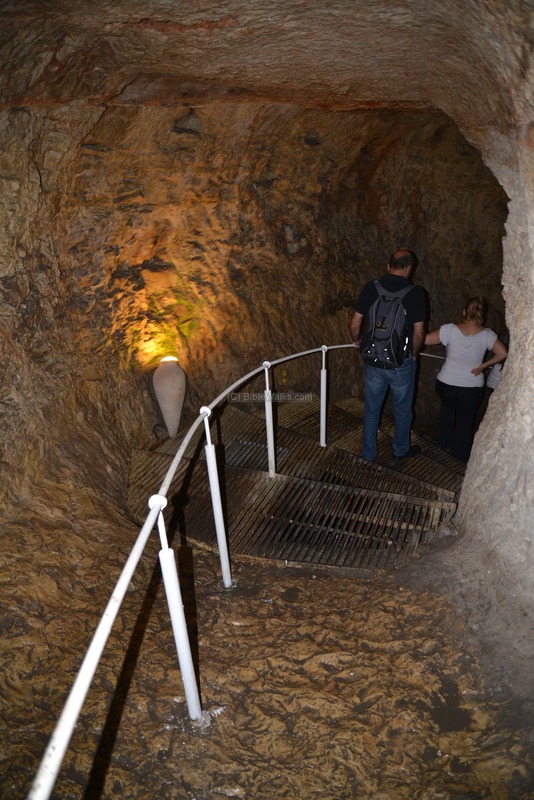 The rock-hewn "Hezekiah" tunnel filled up the pool of Shiloah (Siloam) inside the walls of the city. Until recent times, the location of the ancient pool was forgotten, as it was replaced with a new pool constructed during the Byzantine period at the outlet of the tunnel. An ancient pool, dated to the second temple period, was discovered in a location southeast of the outlet. This pool, Herodian street and drainage channels are part of the City of David archaeological park. To read more about the Shiloah pool, check our web page of the Shiloah pool and the Central drainage canal. 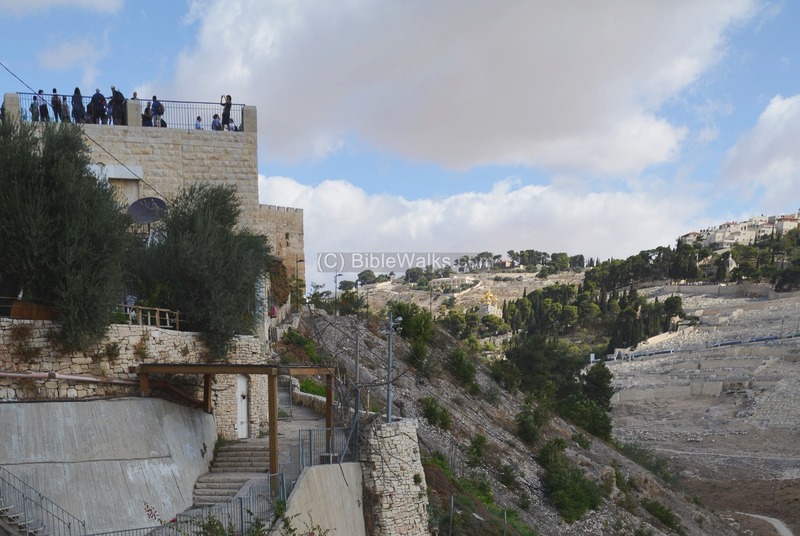 The Beit Hatzofeh ("House of the scout") lookout is located on a balcony of a 100 year old house, overlooking the area around the City of David. The balcony is accessible by stairs from the entrance to the City of David complex. 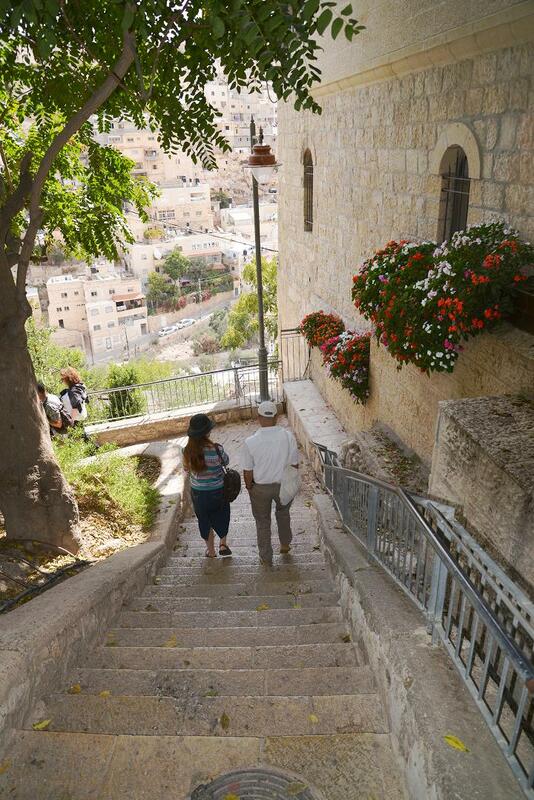 There are great views of the Kidron valley, Mount of Olives, and the southern part of the old city. The Biblical verse best describes the topography around the place (Psalms 125 2): "As the mountains are round about Jerusalem, so the LORD is round about his people from henceforth even for ever". Indeed, the lower hill of the City of David (alt. 701m) is surrounded by higher mountains on all sides (Mt. Moriah alt. 744, on the north with the temple mount on it; Mt Zion alt. 778 on the west; Mt Olives alt. 803 on the northeast and east; Talpiot alt. 795 on the south). David's city started from the lower hill due to the limitation of the water supply, limiting it to the proximity of the Gihon Spring. Only many years later, after resolving the water supply issue, could the city move to higher, more defendable, positions. A panoramic view of the sights around the lookout is seen in this next photo. Pressing on this picture will pop up the panoramic viewer. Using this flash-based panoramic viewer, you can move around 360 degrees, zooming in and out - viewing the site in the amazing full screen mode (like you are really there). Points of interest are indicated on the view. It may take minutes to upload, but then its worth the waiting time. Extensive excavations are conducted since 2007 in the Giv'ati car park, adjacent to the entrance of the City of David archaeological park. The site includes findings from different layers of the city, spanning periods from the Iron Age to the Middle ages. 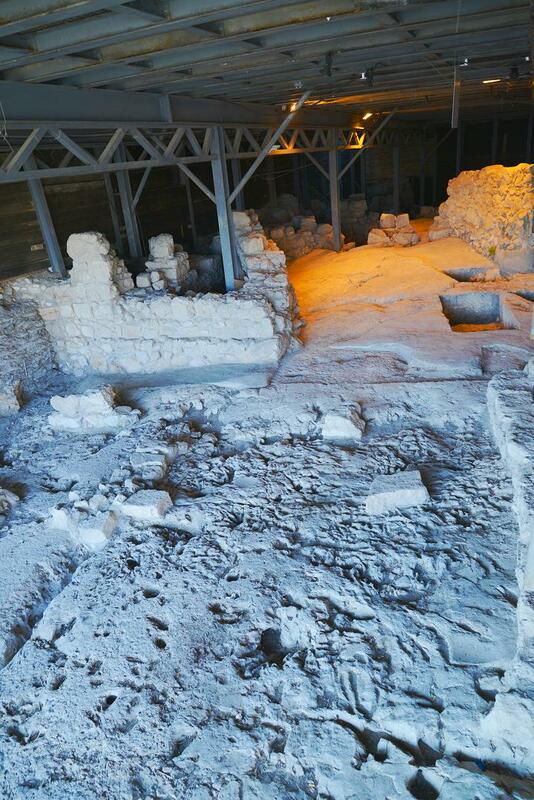 To read more about this excavation site, check our web page of the Givati Car park excavations. David - The Great King. Source of name in Hebrew is David, and the meaning of the name may be from the root name "Dod" or the word Yadid", which means: friend. In the context of a name, this can be interpreted as "friend of God". Biblical reference: there are many references. Example: 1 Samuel 16:13: "Then Samuel took the horn of oil, and anointed him in the midst of his brethren: and the Spirit of the LORD came upon David from that day forward. So Samuel rose up, and went to Ramah". 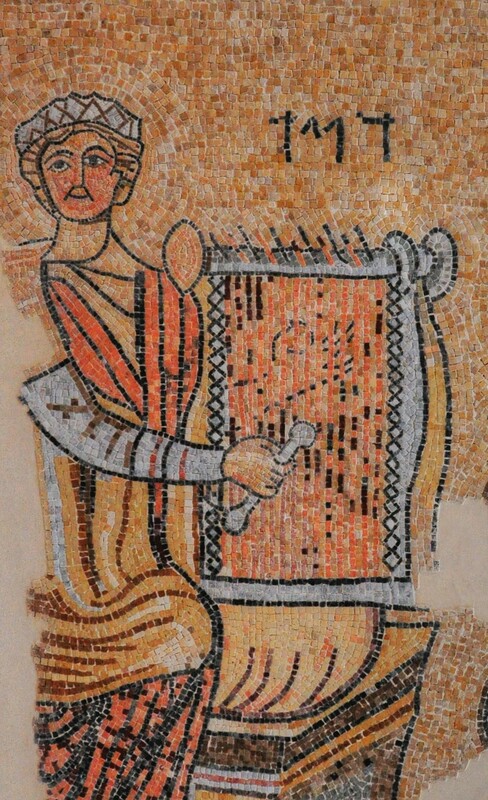 David plays the Harp - 6th C AD mosaic floor from Gaza Maritime. The name "David" is written in Hebrew letters. Shalem (Salem) - name of the Canaanite city of Jerusalem. The Hebrew meaning is : "complete".